If “Wedding Crashers” and “Something About Mary” had an affair, “Bridesmaids” would be their love child. Easily the best comedy of the year, even in the face of adversity with such films as “The Hangover Part II” out, “Bridesmaids” holds its own. Judd Apatow, the King Midas of comedy producers, and Kristen Wiig, with her spot-on comedic timing, joined forces to create a dream team of sorts. The two ingeniously created a balance of the unforgiving honesty of boy humor and effortless chemistry among the cast. The two-hour comedy starring Wiig and Maya Rudolph follows two friends through the sometimes-absurd rituals of marriage. Annie, (Wiig) whose life is a mess, must serve as her best friend Lillian’s (Rudolph) maid of honor. Being the maid of honor means Annie must coordinate events and deal with Lillian’s colorful band of bridesmaids. As the wedding draws closer, Annie’s own personal situation spirals downward, teaching her to fight for what she wants in life. “Bridesmaids” is everything you could possibly hope for in a movie. From Annie’s awkward quirkiness or the absurd antics of Megan, to the pretentions of Helen the pretty friend, “Bridesmaids” exaggerates if not mirrors reality perfectly. Without compromising its integrity as a fall-out-of-your-chair laughing comedy it manages to portray the realities of life. “Bridesmaids” shows the dynamic of best friends trying to retain their friendship while coping with life’s changes. It is nearly impossible to go wrong with Apatow blessing the movie with his golden touch and expert writer Paul Feig’s fantastic dialogue. “Bridesmaids” is truly a horse of a different color. 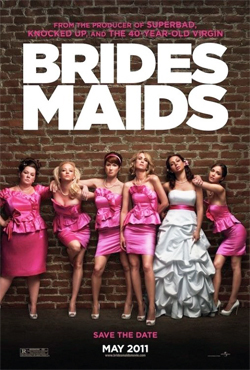 In a world where romantic comedies reign supreme and female characters don’t curse or commit filthy acts, “Bridesmaids” breaks all boundaries. It establishes that a female cast can appeal to both sexes. Experiencing “Bridesmaids” is like a higher power descending for a mere two hours and granting all the glory of witnessing perfection via film.